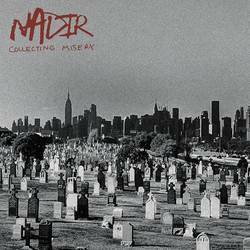 From the start of Collecting Misery it’s clear that Nadir is one of those bands fronted by someone who is usually on a different instrument. Sure, the DIY production also influences the sound, but the vocals are just a bit less fluid than in most bands. It’s not a slight against the band, just that it sounds a little less comfortable. That characteristic has its own kind of charm. Nadir is a band featuring Robbie Swartwood, who has played guitar in Off With Their Heads – maybe since the beginning (I’m not going to fact check this one, but he’s been a staple for a long, long time). One of the first things to note when listening to Collecting Misery is that it’s clear Swartwood has played a role in OWTH songwriting too. That band may be billed as Ryan Young’s thing, but the similarities here can’t be overlooked. First, there’s the subject matter and tone that’s borderline depressed in tone; second, the song structures often use a similar build-up to potent choruses and whoa-oh style backing vocals. It’s certainly less pop than OWTH, but there the similarities shouldn’t be overlooked. While OWTH uses sunny guitar tones to offset some of the gravity, Nadir uses it to highlight specific lyrical snippets. At this point, I should really turn to the content of the record instead of the comparisons, though. All proceeds from the first month of its release are to be donated to Save.org, an organization for those affected by suicide. Without delving too deep into a heavy subject, everything about this, from band name to the album title to the eight tracks within it, are about dealing with depression and the its complications. It’s clear that Swartwood has dealt with the affliction in his personal life and, undoubtedly, anyone reading this has too. While Swartwood’s voice doesn’t have a lot of range, the record itself does. There are the poppy jams that fans would expect, but also heavier songs like “Buried Above Ground” and acoustic songs like “Collecting Misery.” “Early Graves” may be the most unique song, considering the band’s pedigree. The song takes a heavy riff, shout-sung lyrics, and a hitting refrain of “This freedom has become another cage.” It dabbles in heavy rock, repetitive chords, and melodic choruses while landing somewhere in the middle between melodic punk and chugging rock. While there are a couple fleeting moments where this sounds like Off With Their Heads with a different singer, it’s far and away its own thing. Editor’s note: Anyone experiencing suicidal thoughts or depression should seek assistance. You aren’t alone. Posted April 15, 2019, 7:56 p.m.
Posted Feb. 9, 2019, 1:04 p.m.